I love pinterest and everyday I find new ideas there. 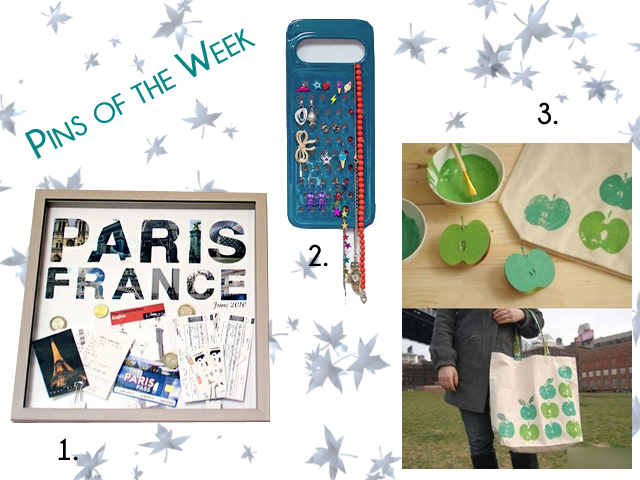 Today I present my pins of the week in the category DIY. 1. Ich sammle gerne Souvenirs, nur leider liegen sie bei mir irgendwann nur noch in einer Schublade herum. Deswegen gefällt mir die Idee mit dem Rahmen und den darin enthaltenen Erinnerungsstücken sehr gut. I love to save memorables from my last vacation, but at some point they are just lying in some drawer and are never seen by anybody. Therefore I love this idea to keep your memorables where you can see them. 2. Ich besitze zwar nicht so viel Schmuck, aber doch soviel, dass mein Schmuckkästchen langsam auseinanderplatzt und zufällig befindet sich in meinem Besitz auch eine unverwendete Küchenreibe. Also an die Farben und los! I do not own that much jewellery, but it's enough to make my jewellery box burst and coincidental there is also a grater in my kitchen I never use. So get your colors and start!